The Boston Red Sox owners have tried their hand at auto racing, golf, college sports and -- of course -- baseball. They even kicked a little soccer around before making a deal to buy Liverpool of the English Premier League. 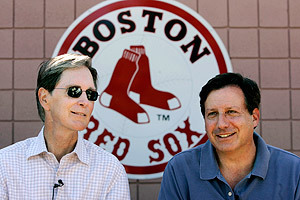 AP Photo/Steven Senne Red Sox owners John Henry, left, and Tom Werner have a deal to obtain Liverpool, one of soccer's best-known and most successful club teams. New England Sports Ventures, the company that owns the Red Sox, reached an agreement with the Liverpool board Tuesday night to buy the financially hobbled soccer club for $477 million. Most -- if not all -- of the money would cover the debts run up by current Liverpool co-owners Tom Hicks and George Gillett Jr., who are expected to challenge the deal in court. If the deal survives the legal hurdles, the ownership group led by financier John Henry and TV producer Tom Werner thinks it can restore the once-proud soccer club to its former glory. "NESV wants to create a long-term financially solid foundation for Liverpool FC and is dedicated to ensuring that the club has the resources to build for the future," Henry's group said in a statement. "Our objective is to stabilize the club and ultimately return Liverpool FC to its rightful place in English and European football." Hicks also went from baseball to soccer, having dragged the Texas Rangers into bankruptcy before selling the ballclub this summer. His Liverpool ownership was similarly troubled, largely because of debt taken on to finance the purchase; the team is off to its worst start in more than 50 years, and fans have taken to yelling "Yanks Out!" 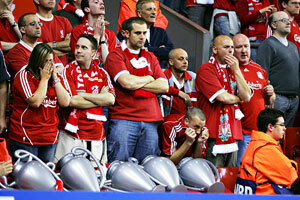 The new owners think they can overcome the anti-American sentiment at aging Anfield. When Henry and his group bought the Red Sox, they were viewed in Boston as outsiders who couldn't understand or appreciate the fans' passion for a team that hadn't won a World Series since 1918. They talked of replacing Fenway Park, a decrepit but beloved landmark. Instead, NESV has put more than $250 million into fixing Fenway, making it once again one of the jewels of the major leagues. And they have shown a willingness to spend money on payroll, with salaries each year that are second only to the uber-rich New York Yankees. "We have a proven track record, shown clearly with the Boston Red Sox," the NESV statement said. "The team has won two World Series championships over the past six years. We will bring the same kind of openness, passion, dedication and professionalism to Liverpool FC." And it won't affect the ballclub, Red Sox president Larry Lucchino told fans. Matthew Ashton/Icon SMI Liverpool fans, who have been calling for new ownership to replace Tom Hicks and George Gillett Jr., may get their wish by the end of the week. "It is not an undertaking of the Boston Red Sox and will not divert our resources or focus on the job at hand -- winning a third World Series for the loyal members of Red Sox Nation," he said. "We want to assure our fans that our work and our Red Sox resources will continue to be devoted to fielding excellent teams in 2011 and beyond, teams worthy of our fans' avid support." NESV owns the Red Sox, most of their TV network, their ballpark and one-half of Roush Fenway Racing, one of NASCAR's most financially stable teams and a perennial contender. Also in the fold is Fenway Sports Group, a sports marketing firm that has dabbled in minor-league baseball, beach volleyball, golf and Boston College athletics. It's not the first time the Red Sox crew has dipped its toe into European soccer. Fenway Sports Group has had a marketing alliance with Fulham, the oldest pro team in London but a lower-profile club than Liverpool. And this summer, a match between Sporting Lisbon and Glasgow Celtic at Fenway Park drew more than 32,000 fans for "Football at Fenway." This week's deal was joyously welcomed by the Liverpool FC Supporters Club of Boston, one of the team's largest fan clubs in the U.S. Many of the 300 members are also Red Sox fans, and they hope their overseas brethren give Henry a chance. "He's done a tremendous job at restoring Fenway and helped the Red Sox win a World Series not too long after taking over," said Tim Treacy, LFC Boston chairman. "Liverpool hasn't won (an English league) title in 20 years. If he can do the same here it would be just amazing."